Congratulations! You've been formally invited to the GTA 5 beta test starting soon on Xbox One. This invitation may come as a surprise. After all, you never even applied for such a test. The truth is, Jeremy, we've been watching you. Through the camera on your Kinect, we've seen you do some amazing things with your Xbox One. Like that time you pumped your fist and yelled, "Yeah! Got 'em!" Or that time you dropped your controller like an MC dropping the mic. We don't actually know what was happening in the game (the Kinect's pointed away from the TV) but we surmise you did something impressive - beta tester impressive. You'll be testing the game with the best of the best. Raul Garcia, also known as the Nicaraguan Octopus, who plays four-player split-screen games by himself with his two hands and two feet. Basil Templeton, the arrogant yet talented Call of Duty pro from the UK. Ada Reinhart, the German ice princess who's known only the touch of her controller since the death of her dearest Uter. Make no mistake: you're being teamed up with the best of the best. And you'll be wearing matching jumpsuits. The GTA 5 beta test will take place in a top-secret facility somewhere in the Midwest. In a bunker beneath the cornfields of our nation's heartland, you'll push the game to its limits. In turn, it will push you to your limits. You will master the Grands, the Thefts and the Autos. You'll spar with Basil and eventually earn each other's respect. In a late-night session of testing the Content Creator, you'll lock eyes with Ada and break down the Berlin Wall surrounding her heart. For lack of a better character arc, Raul will die right before graduation. He pushes himself too hard and pays the ultimate price. Man wasn't meant to complete a four-man heist by himself, Raul! You'll find him slumped over in front of his console, hands and feet bleeding from extreme heistin'. Ada will call for the paramedics - too late. "Remember me when you dupe cars," he'll say before dying. But, you know, probably in Spanish. Then, in a ceremony attended by dignitaries from the GTA 5 community, you'll graduate with honors. Rockstar president Sam Houser will congratulate you three on surviving the worst Los Santos county could offer. "You've provided valuable feedback that will help us refine the gameplay systems," he'll say. "You can keep the jumpsuits." Are you ready for this experience, Jeremy? 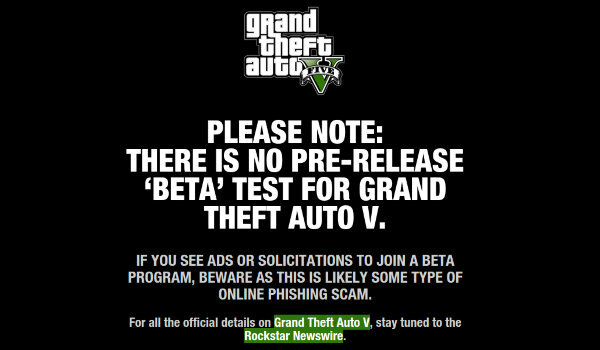 If so, all you need to do is visit grandtheftauto-betaz.com to confirm your spot in the beta. You'll just need to provide your name, email address and the first sixteen digits of your credit card.